In a very large skillet over medium heat, melt the butter. Add the onions and cook, stirring occasionally, until starting to become soft, 8 to 10 minutes. Reduce to low and cook, stirring occasionally, until golden, about 1 hour. Stir in the beef stock and remove from the heat. While the onions are cooking, in a microwave-safe bowl, combine the tomato paste, water, oregano, vinegar, sugar, garlic, and cayenne. Cover loosely and cook on high for 1 minute. Add salt and pepper to taste and set aside. On a lightly floured work surface, roll the dough out to an 18- to 20-in. round. Transfer to a 16-in. pizza pan and arrange 1/3 of the mozzarella in a ring just inside the edge of the dough. Fold the dough over the cheese, pressing to seal. 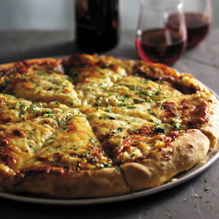 Spoon the tomato sauce onto the pizza, then top with the provolone, onion mixture, remaining mozzarella, and Gruyere. Bake until the pizza is golden, 25 to 30 minutes. This pizza came to life when both my wife and I were craving French onion soup. My son, who does not like onions, eats the pizza and likes it.